At La Jolla Piano Institute, we don't just teach, we motivate! Our philosophy involves training the student to think in terms of sounds instead of notes. Language has the same basis. We learn to speak by hearing the sounds aurally, not visually. Later, we learn to read to the sounds already learned as a spoken art and not the other way around. 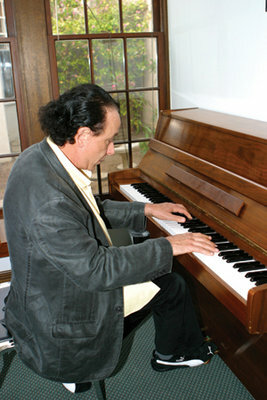 Marden Abadi, founder of the La Jolla Piano Institute, knows about motivation and dedication. He began playing the piano at the age of five and perfected his craft following years of serious study. Mr. Abadi has successfully taken the Suzuki philosophy and expanded and adapted it to fit his style of music and the needs of his American students. His goal in teaching is not unlike his goal in the monument concerts: to bring music closer to people. See his students putting the Suzuki method to use at the annual recital! Suzuki Methodology involves working with music that is not arranged, simplified, or altered in any way so the student is immersed in the musical creation as it was written. This music is carefully taken apart and as the student acquires technical skill, is put back together again little by little like a puzzle. Our curriculum is unique in the world because it consists of both classical and contemporary music in its original form. The key to the student's progress is not the difficulty of the music but the interest of the music. A simplified or arranged composition cannot hold that interest. Though original music is intrinsically more difficult, the perfection of the original music in itself becomes easier for the student. We are thrilled you have decided to enroll in the most enriching music education program in La Jolla. We are confident you will see rapid progress in your child’s ability to play music and desire to learn more. This packet is designed to provide you with some basic information, and to collect information from you, as you enroll in lessons. Feel free to email us if you have any questions or would like to enroll!